There were a few unknowns facing the England team when it came to this year’s VHI; the addition of 65s to the team, a new relay format devised by Rob Hickling from Scotland, and agreed by all the team managers to be trialled on a one year basis (more of that later), some last minute fitness problems and replacements and most notable, facing the Scots on their home turf which usually poses a challenge. 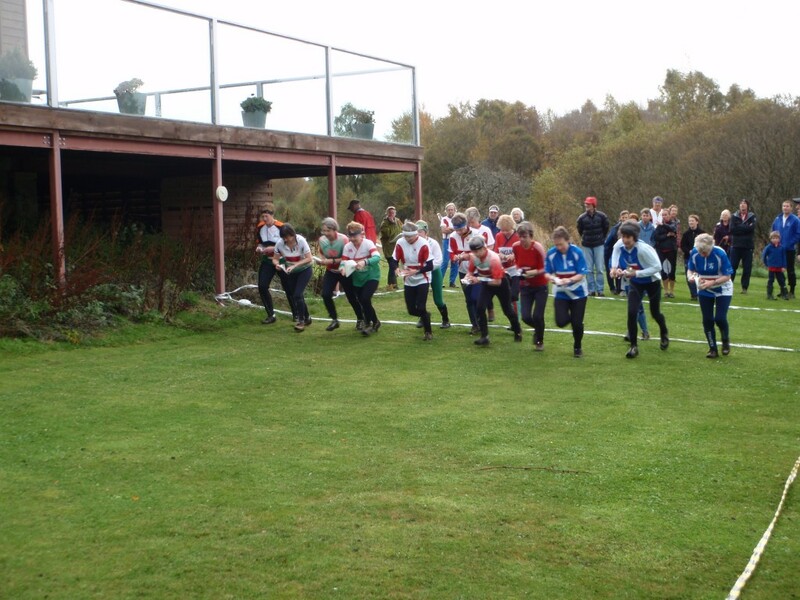 The relay was held at Coull just to the east of Aboyne and it was a beautiful setting beside a loch, with a golf course surrounding the main building and the forest a short way in the distance. The relay format was changed to 8 courses – 4 for teams of 2 men and one woman, and 4 courses for 2 women and one man. The sum of the ages had to add up to 150 and there were some restrictions on which classes could run as the single woman or single man. The course lengths were Short, Long, Long, for the WMW combination, and M, M, XL for the MWM combination. The idea behind the change was to accommodate the new age span (35-65), shorten the relay overall, and add a competitive edge by everyone running the same course at the same time, though gaffled but inevitably some head to head racing. Unfortunately there was a mix up with the maps, and after several very worrying minutes when none of the English women came back on the first short leg, it became apparent that something had gone dreadfully wrong and our women (W55, W65 and both W60s) had in fact been given Long rather than Short maps. The 2M1W part of the competition went as planned though it lost some of the excitement for the spectators with the mess over the other competition, but there were some very narrow finishes with again England just taking a lead due to a Scottish team disqualification. It was agreed by a majority decision by the team mangers that the relay trophy should not be awarded on the basis of half a competition and therefore the overall trophy was not awarded either. s for the rest of the weekend the Scottish organisers did a great job with a splendid social evening including story telling, live music and a tasty supper at the local Albert hall which was merely a couple of minutes walk from the accommodation. 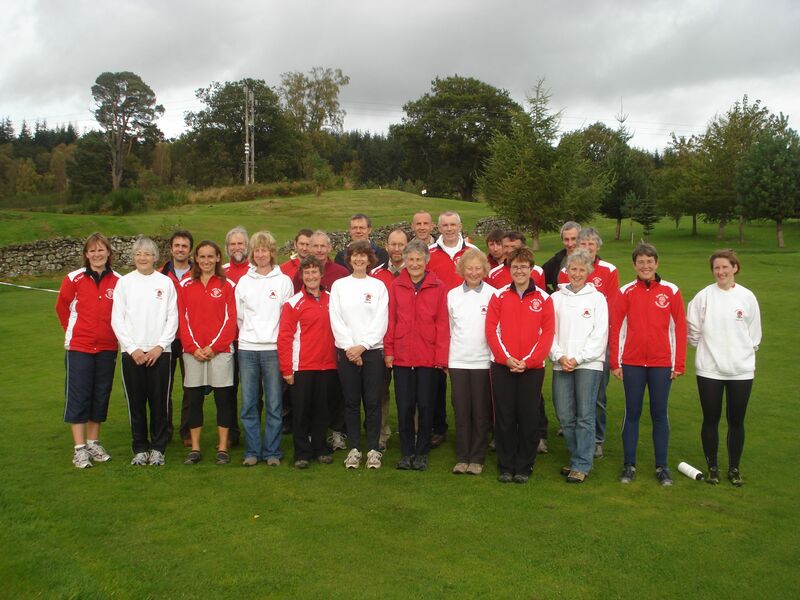 We were also blessed by calm, mild and dry weather and indeed as we gathered for the team photo, the sun shone. Yes of course we are all disappointed that we didn’t have the full event but we were delighted with the team’s individual win, and every competitor, whether competitive or not, enjoyed running at Coull.